BIG KAISER, a leader in premium high-precision tooling systems and solutions for the metalworking industries, will be hosting its 6th annual Breakfast & Learn event on May 8-10, 2018. BIG KAISER’s facility is located in Hoffman Estates, IL right next to DMG MORI, which will be hosting its Chicago Innovation Days event on the same days. 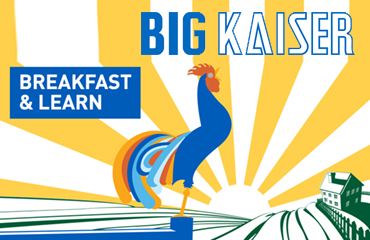 Before the event starts, join BIG KAISER at 7:30 ameach morning to enjoy a complimentary breakfast followed by technical sessions on important topics and new trends in the industry. High performance milling centers are purchased with the intention of increasing throughput and workpiece quality. To achieve this goal, many of the traditional methods and tooling must be changed, especially when working with hard metals and/or high-speed cutting. Cory Cetkovic will outline the current advantages and disadvantages of each type of tool holder and offer suggestions for applying each technology for optimum output and quality. Digitally connected tools offer several advantages to machining processes. From permitting better assurance of correct sizing adjustments, to providing historical data of past adjustments, and displaying real-time data on cutting conditions. Discover how these tools will assist in giving a real-time assessment of productivity, and permit better decision making for future planning. Five-sided machining requires workholding products that offer maximum versatility and functionality, while providing interference-free spindle-to-workpiece access. Programmers, fixture designers, and manufacturing engineers with limited exposure to 5-axis machining will find helpful tips and understanding of workholding systems available to maximize and simplify machine setup. Visitors will also have the chance to tour BIG KAISER’s showroom that is equipped with tool presetters, extensive tooling displays and zero-point workholding solutions. Doors will be open all day long for visitors of Innovation Days Chicago to stop by and talk to engineers about tooling solutions and needs. To register, please visit https://us.bigkaiser.com/breakfast-and-learn-rsvp.php. BIG KAISER is a worldwide leader in high-precision tooling systems and solutions for the metalcutting industry that guarantee extreme accuracy and repeatability. Our products are of the utmost quality — manufactured with materials and craftsmanship that enable superior performance. As a member of the BIG DAISHOWA Group (Osaka, Japan), BIG KAISER has grown into a well-recognized global tooling provider, with manufacturing facilities in North America, Switzerland and Japan. In addition, BIG KAISER is the North American representative of Sphinx, Speroni, and UNILOCK by Innotool. For more information, contact BIG KAISER, Hoffman Estates, IL at 224-770-2999, e-mailbigkaiser@us.bigkaiser.com or visit www.us.bigkaiser.com.